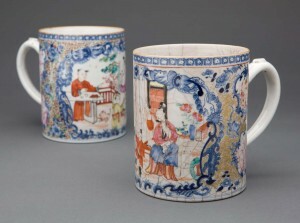 Chinese porcelain one-quart mugs in Mount Vernon's collections. Probably sent from London in 1766. Why is it important to be able to measure capacity from archaeological or museum collections? 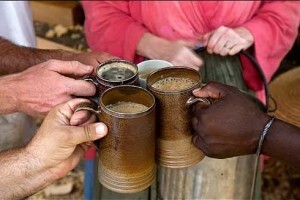 Do we really need to over-think the solo cup of the eighteenth century? Well, capacity apparently mattered to George Washington who ordered and received approximately 72 ale and beer drinking glasses on multiple occasions between 1757 and 1772 and specifically asked for different sized mugs. The material of these vessels varied and included stoneware (brown and white), Chinese export porcelain, creamware, glass, and tin. Sizes ranged and included gills, half-pints, pints, tumblers, quarts, and pottles. Over time, it appears that Washington needed a greater variety of vessel capacities to suit different social situations while simultaneously pottery factories increased their range of capacities. For example, Washington is invoiced for brown stoneware (possibly Nottingham) mugs in March of 1761. They ranged in size from ½ pint to pint to quart. In 1770 and 1771, when Washington receives his large order of creamware, those mugs vary in size from ½ pint, to pint, to quart, to pottle. This larger range of capacities fits well with the argument that archaeologists have made about the increased elaboration and specialization occurring in the realm of dining as the eighteenth century progressed. Drinking scene from Colonial Williamsburg. We know that as Washington’s status increased over time, his participation in the consumer revolution also increased and he, like many of his peers, used material culture to communicate personal qualities and beliefs that, if spoken, might be considered bragging or posturing. Did non-elites in colonial America desire to show their mastery of fashionable dining and entertaining habits through the use of mugs of differing capacities? Did that even matter to them? Were these quantities available to middling and lower classes at local stores, or could they only be acquired by ordering abroad? By calculating vessel capacity of mended sherds in the archaeological record from different sites, we can begin to explore the nuances of the consumer revolution as it was experienced by different folks who, thankfully for our sake, tossed their garbage into nearby pits, wells, and cellars. ©2013 Mount Vernon Ladies' Association. All Rights Reserved.